Guntur known for its chillies is set to become an important city. Residual state of Andhra Pradesh, after creation of Telangana, has chosen its capital to be in the area between Guntur and Vijaywada. Rapid urbanization is on its way. It is high time that the city starts upgrading its infrastructure and pursues the path of inclusive growth. I’m here in Guntur at the invitation of colleagues from Dalit Bahujan Resource Center (DBRC). They work on entitlement based issues including land rights for oppressed classes and marginalized communities. Last year, they decided to engage with wastepickers in both Vijaywada and Guntur. Guntur, as per the estimates provided in the 2010 City Development Plan, generates around 350 Metric tons of waste every day. Out of which 310 MT is collected daily and sent off to the dump yard. Dump yard is located in Naidupet and occupies 72 acres of land. 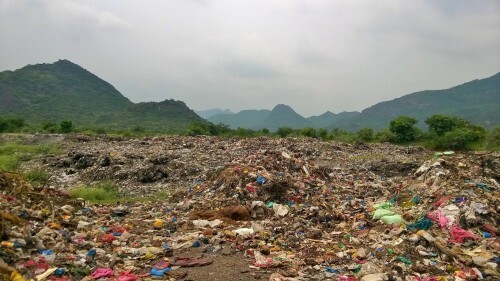 The dumping site is placed at a very scenic location, right at the bottom of hills with a small pond in neighborhood, which by the way provides water for many residents in the area. To ‘scientifically’ manage the garbage mess Municipal body with state government has proposed ‘waste to energy’ plant. The City development Plan mentions that only 6% i.e. 20 MT of waste is recyclable, and rest is inert and organic 31 and 63 percent respectively. Anyone who has studied waste ecologies in India will call the estimated percentage of recyclables a farce. Real time data availed from the sample of more than 12497 households in Bangalore, provided by Hasiru Dala, states that 68.5 percent of waste is organic, 21 percent is recyclable and rest 10.5 percent is reject and sanitary. Proportion of recyclable material is higher than the estimates given by Municipal body. If that was not the case, city would not have had 1000 wastepickers running the informal waste economy on their shoulders. The higher percentage of inert on paper will be helpful in strengthening the argument for incineration, thus the proposition of waste to energy plant. ‘Waste to energy’ is based on incineration technology and has severe impacts on health, environment and economy. Instead of incineration a stronger emphasis on recycling will create a ‘win- win’ situation. It will help provide raw materials to the industry and support communities who are engaged in wastepicking.